What is an Anti Spam Gateway Filter? An anti spam gateway filter is software-based virtual appliance that is installed on site, rather than in the cloud. Located behind the firewall, an anti spam gateway filter typically prevents in excess of 99% of spam emails reaching their destinations – enhancing productivity and mitigating threats from phishing, malware and ransomware. However, it is important to note not all gateway spam filter solutions are equally as effective. Some have mechanisms that prevent most unsolicited bulk emails even reaching the spam gateway – reducing the demand on network resources, and the number of email threats that evade detection. This type of anti spam gateway filter can achieve spam detection rates of 99.97%. The key feature of a gateway spam filter that helps achieve such a high spam detection rate is “Greylisting”. To understand why Greylisting is so effective, it is important to know that spam filters without this feature identify spam by comparing the IP address of the sending mail server against a RBL blacklist of IP addresses from which spam is known to have originated. In the Greylisting process, every incoming email is returned to the mail server from which it originated with a request to send it again. Usually the request is fulfilled within minutes, but spammers´ mail servers – being too busy sending new spam emails – ignore the request. In this way, Greylisting prevents most unsolicited bulk emails entering the spam gateway. Greylisting is provided as an optional control. While effective at identifying spam email, it can delay messages by a few minutes. To prevent this, it can be combined with whitelisting for trusted senders to ensure their messages are not delayed. Having greylisting in place for all other emails is highly recommended. When a mail server responds to the Greylisting request and resends an email, the email then goes through the secondary mechanisms within the spam gateway. These include checking the IP address against an RBL blacklist as above, and assigning a Spam Confidence Score based on the email´s content. The gateway spam filter also looks at Sender Policy Framework and Recipient Verification protocols. A feature that some anti spam gateway filters lack is SUBRL filtering. This secondary mechanism inspects emails and their attachments for URLs that have been reported previously in unsolicited bulk emails. The purpose of this check is to identify links to websites that have been created with the sole purpose of executing a phishing attack. When any matches are found, the email is quarantined for investigation. In order to maximize network security, an anti spam gateway filter should also filter outgoing mail. The reason for this is to identify spamming from within the business that could be inadvertent (i.e. by a careless employee) or that could indicate a business email account has been compromised by a spammer and is being used to send spam from a trusted source. Either scenario could damage a business´s “IP reputation” – a factor that, for some anti spam gateway filters, contributes towards the email´s Spam Confidence Score. In extreme cases, unidentified outgoing spam can lead to a business´s IP address being added to a RBL blacklist, which would not only affect its email communications, but also access to its website(s). 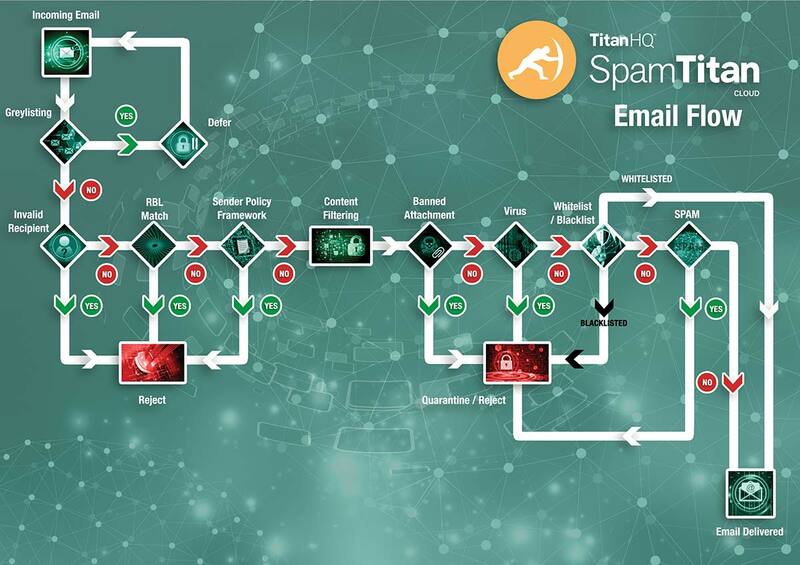 SpamTitan´s gateway spam filter includes all the features business´s need to enhance productivity and mitigate threats from phishing, malware and ransomware by preventing 99.97% of spam from reaching employees´ inboxes. However, rather than load our gateway spam filter with complicated controls, SpamTitan has been designed to be user-friendly with low maintenance overheads. Implementation of our anti spam gateway filter takes just a few minutes, the configuration of the filtering mechanisms is straightforward, and the application of user policies can be achieved quickly via directory synchronization. Management of the gateway spam filter is via a centralized web-based portal, through which administrators can schedule reports and access quarantine logs in real time. SpamTitan´s gateway spam filter includes all the features mentioned above to deliver a verifiable spam detection rate of 99.97% with 0.03% false positives. Our dual anti virus software has a 100% record of capturing inbound and outbound viruses, and includes advanced features for IP protection control. Furthermore, SpamTitan can help protect ant number of users, or any number of domains, and is universally compatible with every type of operating system. To find out more about the features of SpamTitan´s gateway spam filter, and to request a free trial to evaluate SpamTitan in your own environment, do not hesitate to get in touch. Our Sales Technicians will be happy to answer your questions about our anti spam gateway solution and explain more about how the secure email gateway will work in your specific circumstances. There is never a bad time to reduce spam and your exposure to email-borne threats, so contact us today.